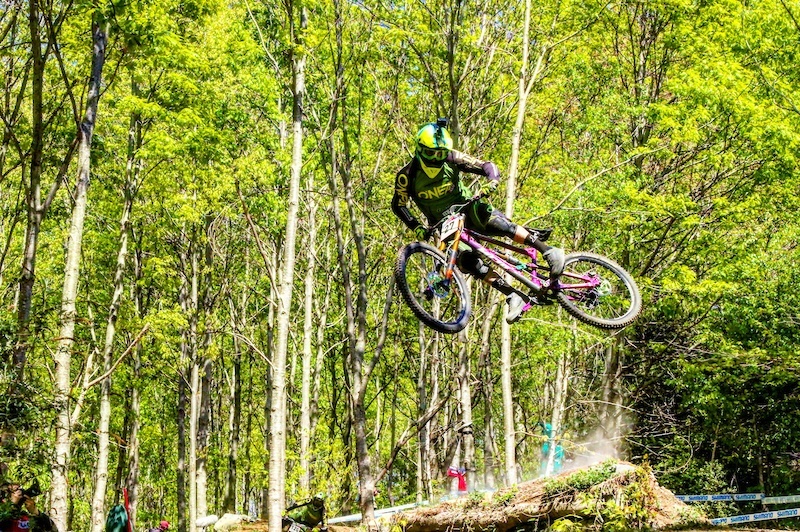 World Cup racing. It came back at the weekend and we were super excited to get the 2017 season underway! 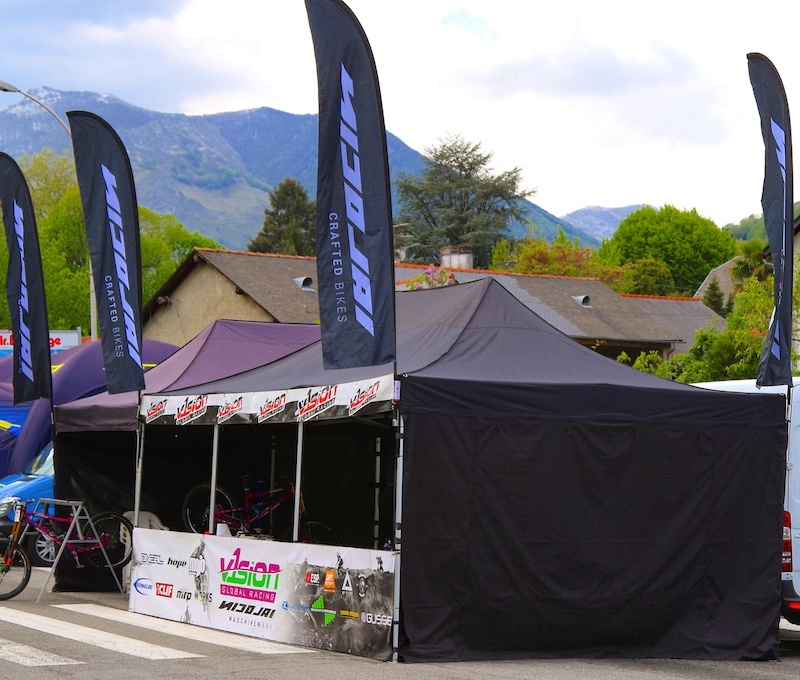 We arrived in Lourdes on Wednesday to get our new team pit set up for the weekend, as well as walk the track and prepare the bikes on Thursday. 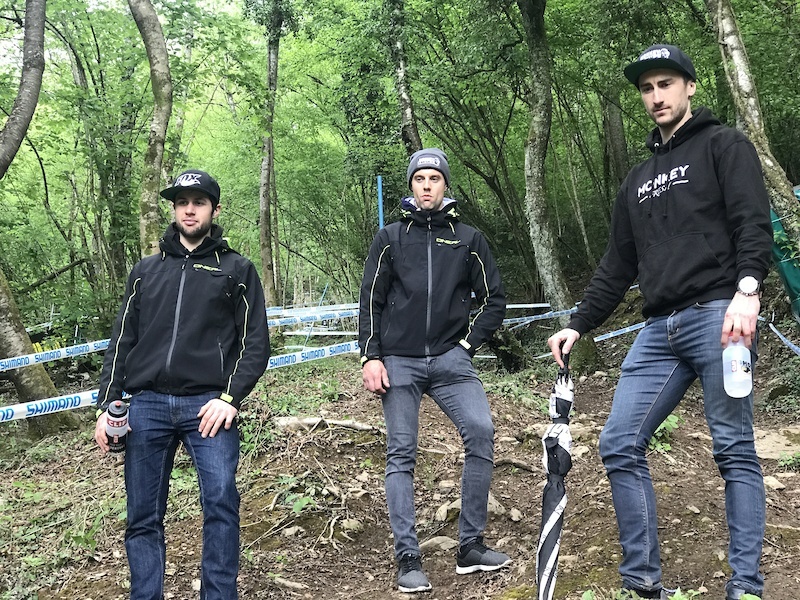 Lourdes had seen rain in the run up to the event, so the track was going to be slippery at the start of practice for the guys in group B first thing on Friday morning! Luckily all of our guys were in group A and wouldn’t start practice until 11.45am on Friday, so by then we knew the track would be dry and the lads had their Schwalbe Magic Mary tyres on ready for the fast conditions. The track was running so fast on Friday, and Jack George and Willz did their best to get as much speed going as they could as they moved through the day. We had to do a lot of work on suspension setup throughout the day to get the bikes feeling stable and smooth over the big bumps and through the large holes that developed! We increased the rebound on our Fox 40s and Fox Float X2 rear shocks and ran more pressure than usual to avoid too many harsh bottom outs. When the timed practice session started all three Nicolai Geometron G19s were running sweet and Jack and George put down a timed run of 3.11 and 3.13 respectively. The guys went for a track walk after practice to see how things were changing on the hill. It’s important to see where the big holes appear and if any new faster lines are there to try the following morning. 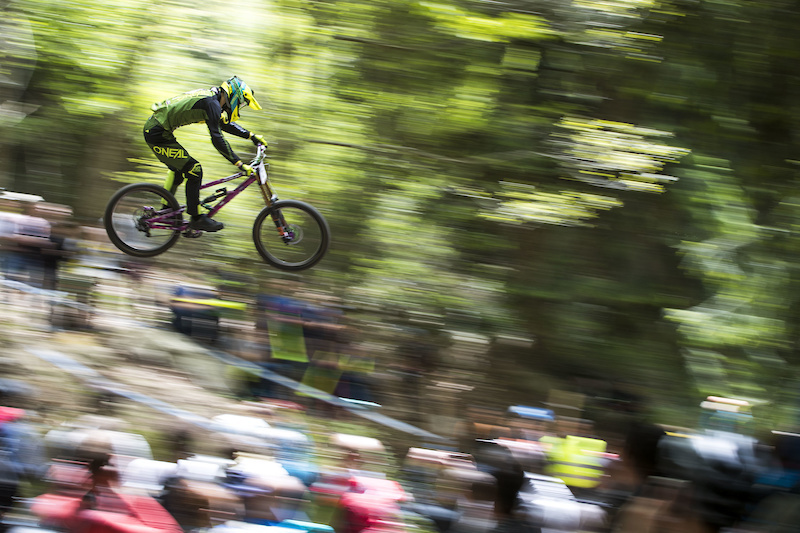 When the guys got down and saw the timed practice results they got a shock. It turned out they weren’t going anywhere near fast enough yet: Jack was in 50th and George in 51st, 14 and 16 seconds behind the fastest time respectively! Qualifying morning was going to be very important, as the lads had limited time to find a good handful of seconds to guarantee qualification! There was a nervous vibe in our pits that evening that’s for sure! The qualifying day practice session was only an hour and 45 minutes long, but the lads used their time well and did 3 runs and some helmet camera timing to see if they were improving on the timed training pace. They felt they’d found 5 or 6 seconds by the end of the session and were going into qualifying a bit more relaxed. Jack was first up ranked 27th following his 2016 overall, and with the timing down at the finish when he came through, we had no idea how he’d done for a good while. He wasn’t happy with the run, saying he hadn’t managed to relax and get into a flow at the bottom, and thought he’d done something like a 3.08ish. George next and he put a solid time down of 3.03 feeling like he had more to give come finals which was great! He’d taken 10 seconds off his timed practice run! We then found out Jack’s time and that was actually a 3.03 as well despite his disappointment! This left Jack in 42nd and George in 43rd in qualifying, both excited to try and go sub 3 minutes in finals! Willz up next and hitting top 80 at every split point on the way down, he was looking good! Unfortunately he ran off line right at the bottom of his run and had to drop low of a tree and lose a few seconds. This left him in 87th, 1.4 seconds off qualification and not racing finals! This was a real disappointment for the team and of course Willz was gutted. Race day and the storm that had been on the weather forecast all week was still promised. It was supposed to bring heavy rain at some point during the afternoon! The lads runs were at 2.36 and 2.37pm, so it was a case of, was it going to rain during the race, and if so, would our guys be down by that time or not. 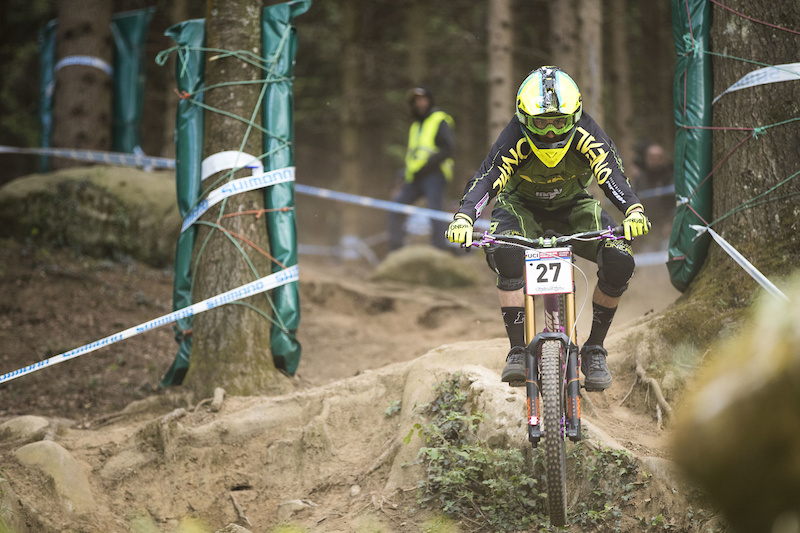 Lourdes in the wet is such a difficult track, practically un-ride able in fact, as the hard pack ground gets super greasy, so everyone was hoping the storm would wait until the race was over. Jack had a good morning practice session, blasting through his lines a couple more times reminding himself how fast he was going to have to go come finals. The crowd was starting to build down the track and the atmosphere was pulsing. Unfortunately disaster struck for George and through no fault of his own. The wind was very blustery all morning as the weather system started to arrive in the mountains. A strong gust caught George as he went off the finish jump in his final practice run, and the crosswind caused him to land sideways and get ejected over the handlebars on landing. He slid for ages down the gravel landing and tore himself to pieces. His knee was badly damaged and he had to go straight to hospital to have it operated on, so that was his weekend over. 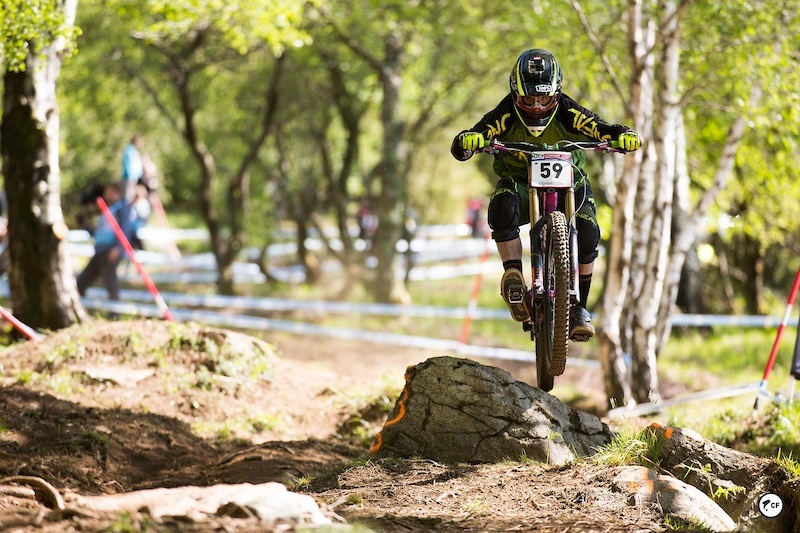 We hope he’ll be fighting fit by the next round in Fort William! Finals and just Jack to fly the One Vision flag. We were lucky enough to have Paul Jeffrey of ‘3 Point Therapy’ with us for the weekend to provide Soft Tissue Therapy, and he had kept Jack in perfect working order all weekend! On such a rough track the body takes a kicking, even without any crashes, so it was so important having Paul with us! With mechanic Lars Jones on hand as well, the bike was running perfectly ready for the run! The weather was getting worse and as Jack warmed up at the top rain droplets had started to fall on and off, and the rest of the team waited nervously at the bottom hoping he’d get a dry run. With 10 minutes to go before he dropped in, the weather seemed to clear up a bit, the wind lowering and no sign of rain. 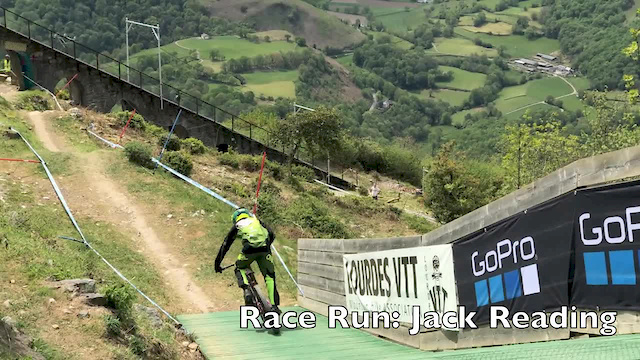 Jack hasn’t had a good start to a world cup season for 5 years due to bad luck with injuries and punctures, and it looked like his luck was finally changing. When he left the gate he still had prime conditions! Jack’s run was great he said. He made no mistakes, just mentioned over breaking in 2 places towards the bottom, explaining why he lost about 1.5 seconds in the bottom sector. He came down and went into 5th place with a time of 3.00.65, 3 seconds faster than his qualifying time, so we hoped he’d pull through for a result in the low 30s which would be a solid start to the season. Then the storm arrived. 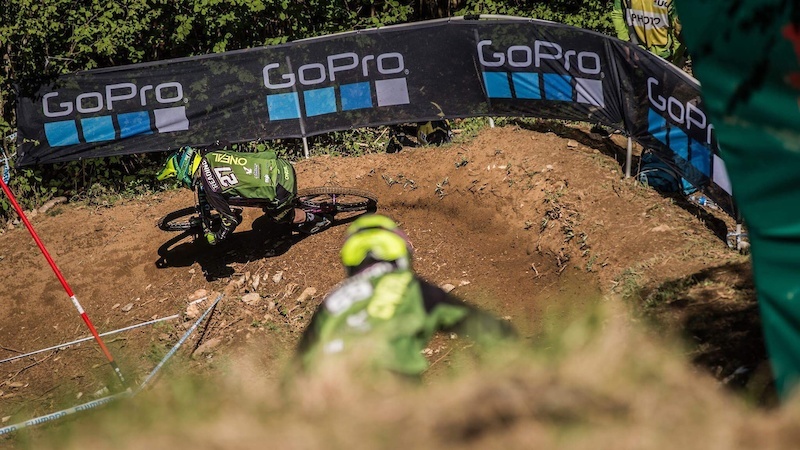 Jack was already in 24th place when the track got wet enough to start ruining the race, and that’s where he remained, because for the last 10 riders the track was a war zone. Imagine glass, with butter on it, that’s what the guys were trying to ride down. 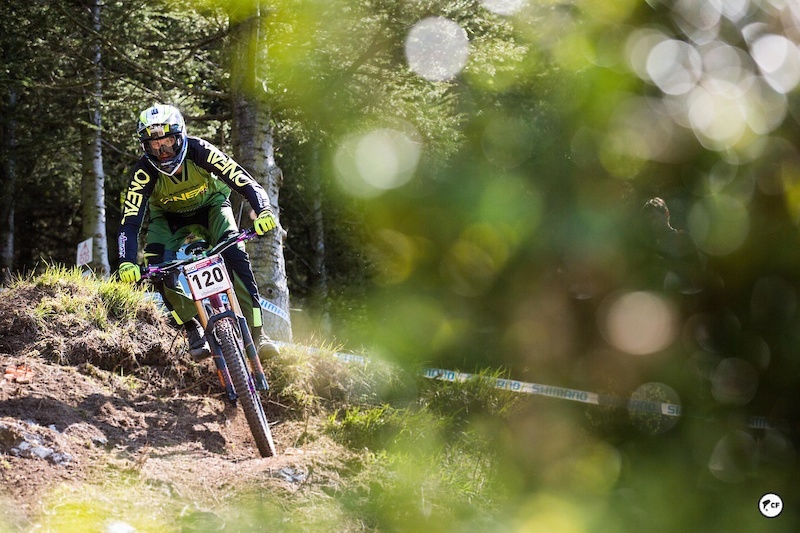 So very strange circumstances but it means Jack will take the 26 board to Fort William and round 2 which puts him in a very strong position for the rest of the race season!